Nicolás Maduro does not cross a simple situation in Venezuela. 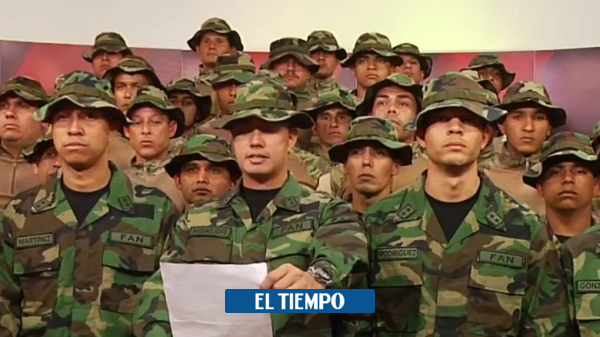 After several leaders of the Lima group declared his mandate is illegitimate and the national assembly of that country openly opposite against his new term, this Monday 27 members of the National Guard rebelled and they tried to steal weapons from a military post. This uprising is not an isolated event. Since 2013, when Nicolás Maduro has assumed power, at least others three incidents against the regime, at the time, they marked the public agenda and highlighted the instability that the country is experiencing today. On 21 January, in the early hours of the morning, 27 members of the Bolivarian National Guard stole war weapons from a military post and took refuge in a barracks. The soldiers who staged this episode were under the command of the sergeant Alexander Bandres Figueroa. Bandres and his men made a call to people to go to the streets and were accused of stealing military equipment. After the neighbors in the place where the events occurred reported that they heard detonations and the use of tear gas, the insurgents were arrested. "It was a clean operation, in record time, without loss of life," said Chavismo number two, Diosdado Cabello. The most recent occurred on 21 January 2019. August 4, 2018Maduro reported being the victim of an attack after two explosive drones exploded near a stage in which he was heading for a military act in downtown Caracas. The socialist leader has accused the vice-opposition Julio Borges, exiled in Colombia, and the former president of that country, Juan Manuel Santos. In this case, around thirty people were arrested, including two generals and the opposition MP Juan Requesens. Maduro said that one of the charges exploded in front of his tribune and another behind the guests. Seven soldiers were wounded. The president was about to finish his speech when a noise caught his attention and looked up. Dozens of soldiers broke ranks and ran in a disorderly way, while the governor's bodyguards covered him with bulletproof shields. Maduro attributed the explosions to an attack orchestrated by Bogotá, Miami and on the right. 6 August 2017Twenty men, including three soldiers, attacked the Paramacay fort in the city of Valencia. They clashed with uniformed officers watching the facilities for more than three hours. Two of the attackers were killed, eight were arrested and the rest escaped with weapons. The group was commanded by former army captain Juan Carlos Caguaripano, who was arrested five days later with another of the attackers. During the assault, Caguaripano claimed in a video that he was in rebellion against the "illegitimate tyranny" of Maduro. He had been expelled from the military ranks in 2014 for rebellion and betrayal. He also assured that his operation had to "re-establish constitutional order", not a coup d'état. The assault raised doubts about the unity that exists in the military forces of that country. 27 June 2017, among the protests against Maduro that left about 125 dead, the ex-police Óscar Pérezon board a helicopter he threw a hand grenade at the Supreme Court of Justice and fired at the Ministry of the Interior in downtown Caracas. After the attack, which left no victims, Pérez published videos in which he asked for the resignation of Maduro and said that his goal was "to restore the constitutional order". He appeared accompanied by armed men. The expiloto and the amateur actor spent several months hiding. In December 2017, a commando he directed gagged the National Guard's militaryI stole 26 kalashnikov rifles and ammunition in Laguneta de La Montaña (Miranda state, to the north). Pérez broadcasts video of the assault. On January 15, 2018, he was killed along with six of his collaborators during an operation to capture him, outside Caracas. Other members of the group were arrested after a clash of several hours transmitted by Perez on their social networks. The opposition denounced the fact as a "extrajudicial execution". The pilot has spread all his operations through social networks.